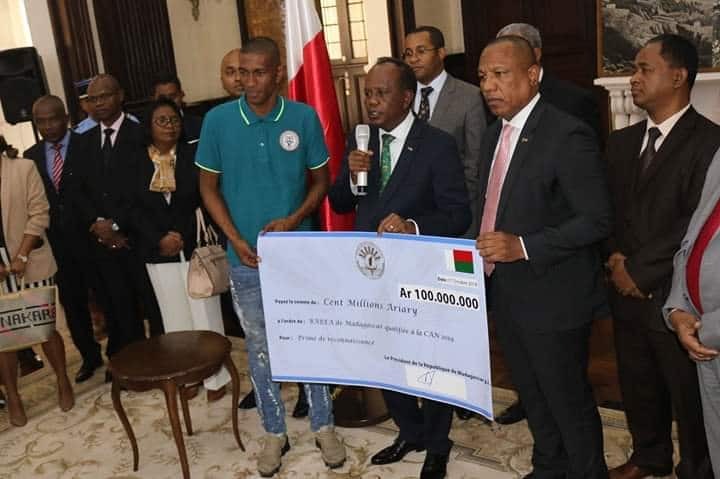 Madagascar senior men’s national team also known as Brea was Wednesday awarded Ksh3 million by their government for the historic Afcon 2019 qualification. The players plus members of the technical bench were handed the amount to share at a function held at the State House in Antananarivo. President Hery Rajaonarimampianina also bestowed national honors on them. The Brea edged out Equatorial Guinea 1-0 on Tuesday to qualify for the Afcon 2019 in Cameroon, a feat never achieved before in the footballing history of the Islanders. Njiva Rakotoharimalala netted the all-important goal in the first half as they became the first team to qualify for the continental showpiece.